Figs. 1-4. Cornutella profunda. All from BSS: 19B(F) EF L50, 61B(F) EF X34, 54B(F), 13B(F2). Fig. 2: forma hexagona; fig. 3 forma bimarginatus. Fig. 5. Bathropyramis infundibulum. BSS 26B(F) EF A43. Figs. 6-9. Tricolocampe corbula. BSS 13B(F2) EF U27, 3x BSS 28B(II). Note smooth, imperforate, plate-like structure directly above and presumably part of the cephalic tube structure (esp. in fig. 9). Figs. 10-12. Tricolocampe aquilonaris. BSS 30B(F) EF S23 and 2x BSS 28B(II). Figs. 13-18. Tricolocampe lineata, with forma arachnea in figs. 13-15 and forma lineata in figs. 16-18. All from BSS; 31B(F) EF W21, 26B(F) EF E33, 38B(F) EF B49, 34B(F) EF W25, 32B(F) EF W42 and 32B(F). Figs. 19~22. Botryostrobus auritus/australis. Fig. 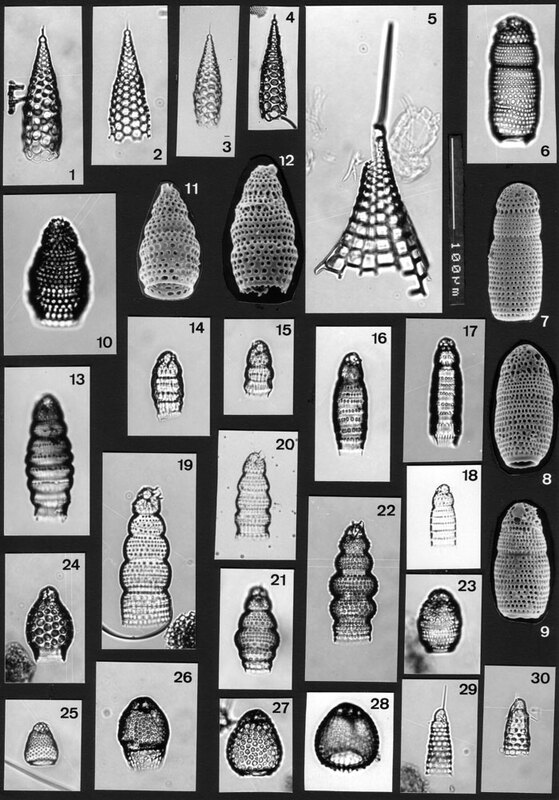 21 shows intermediate morphology between the typical auritus and S. aquilonaris. All from BSS: 32B(F) EF U46, 58B(F), 38B(F) EF S26, 34B(F) EF Z40. Fig. 23. Carpocanium sp. BSS 21B(F) EF F27. Fig. 24. Dictyocephalus papillosus. BSS 34B(F) EF 038. Fig. 25. Carpocanium boreale (Cleve). BSS 38B(F) EF C28. Figs. 26-28. Carpocanium obliquum. BSS 50B(F) EF H34, BSS 19B(F) EF M31 and IOW 156(F). Figs. 29, 30. Cycladophora annulata. BSS 19B(F) EF W41 and 32B(F) EF L52. Note closure of proximal thoracic pores.